Global initiative aims to ensure Mandela's legacy is maintained for the next generation. Machel said Mandela was too frail to travel overseas to the New York launch of the new charity initiative Mandela Day. Mandela, whom she calls Madiba, was spending the day at home in Johannesburg with his family. His wife said he still keeps busy working with his charities but has slowed down, something he finds frustrating. Even with his spirit "fading," Mandela's moral authority remains intact which is why Mandela Day aims to promote the values of Nelson Mandela long after he is gone. 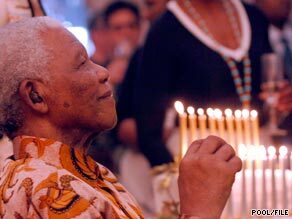 Mandela and his charities are using his birthday, July 18, to urge everyone to do good things for other people.